Recently I used a familiar children’s game to illustrate the challenges of fitting back into our church, family and wider society as we return to our sending country. However, just to increase the challenge, I made everyone play it blindfold! Because that’s just what it can feel like on re-entry. Not only are you unsure what shape you are, you are not certain where you fit in, and you don’t even feel competent to navigate the unfamiliar environment. So let’s have a look at the strategies adopted by those who played the game successfully. 1. They started by working out what shape they were. Having picked up a piece, they felt it carefully to make sure they understood it. Many mission workers returning ‘home’ don’t stop on the way to reflect on how much they have changed since they first left home. Their identity has become a mission worker, a foreigner, a church leader, and if it is not thoroughly rooted in Christ, they will be uncertain of their own identity once they are no longer mission worker, foreigner, or church leader. 2. They felt around in a careful and systematic manner for a place they could fit. They did not randomly try to fit their piece into every hole they found. They investigated each hole with their fingertips to see if it was right, and if it wasn’t, they moved on to the next. On returning to their ‘home’ country, mission workers shouldn’t just assume they will fit back in where they left off. They will have changed, and their home context will have changed, so we all need to be open to the possibility that we will need to find somewhere new to fit. That might mean changing church, moving to a new town, recognising that some old friends have little in common with us anymore, and finding a new ministry through which to serve. 3. They didn’t get frustrated. 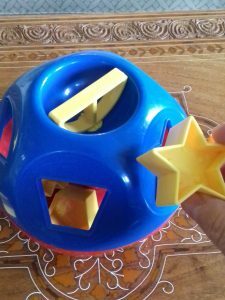 We have all seen a child trying to use force to get a shape into a hole which doesn’t fit it, and returning mission workers can be just the same as they grapple with the powerful emotions involved in re-entry. But taking time, being persistent, and gently manipulating the shape until it is orientated correctly to slot in pays off in the long run. Mission workers often underestimate the impact of re-entry and don’t prepare for it thoroughly like they prepared for going. They either fail to recognise that it will happen to them, or they don’t expect it to last so long – in some cases several years. Syzygy leads retreats and workshops helping mission workers through re-entry, and we also support mission workers on a one-to-one basis. Contact us on info@syzygy.org.uk for more information.